I joined Facebook ten years ago. Making connections was exciting and, in the early stages, anyone with a pulse was quickly a “friend”. That boy in my 8th grade algebra class who I vaguely remember? A friend. The woman I met at a local event? A friend. My cousin I haven’t seen in 20 years? A friend. It was an exciting time and making connections felt good. Now, 350 friends later, I often toggle between staying on Facebook and quiting the social media platform. I know I’m not alone. We weigh the pros and cons. We pledge to spend less time scrolling through the lives of other people and more time living our own life. We set resolutions to start new hobbies, learn new things, and nurture real relationships through tangible connections. You’ve thought it through and you’ve decided to stay on Facebook. At this point, build on what you enjoy about it. To make Facebook great again, you have to be part of the solution, a role model. Here are some pointers and ways to keep it healthy. 1. Find the right balance by setting time limits and making sure the other aspects of your life are front and center: your relationships, work, hobbies, sports, and interests. 2. Model good Facebook behavior by not ranting, posting fake news, participating in time-sucking vitriolic debates, etcetera. The timeless CNN article, The 12 Most Annoying Types of Facebookers, provides a comical read. 3. Remove the app off your phone to remove the temptation to mindlessly scroll. 4. Unfollow or unfriend people who continually post content that annoys you. 5. Unfriend folks who you really don’t know or care to spend time with. I call it the Grocery Store Test. If you saw someone in the produce aisle and you were way over by seafood, would you go out of your way to talk with them (time permitting)? 6. Do not feel obliged to “like” statuses that you really don’t like. The Facebook algorythm is set up so that what you like will appear more on your newsfeed. 7. 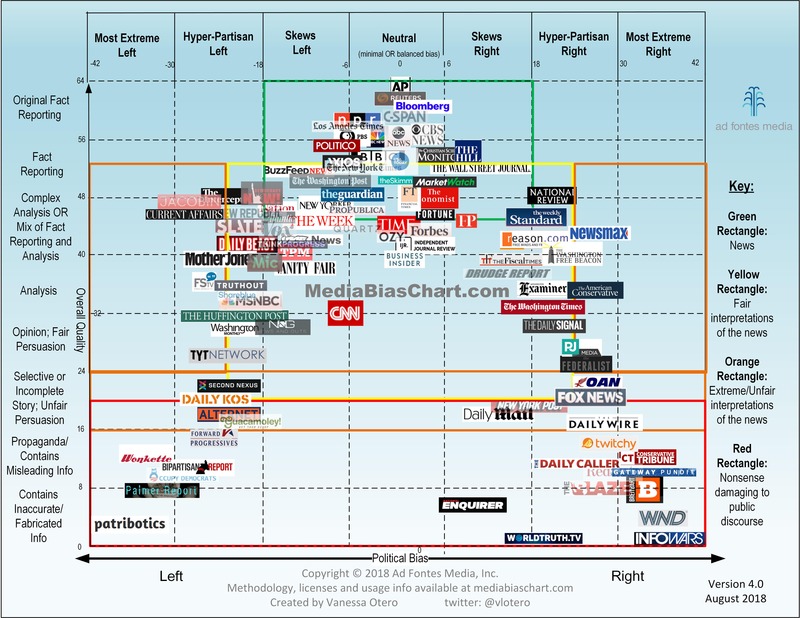 Subscribe to a high-quality online or print newspaper that ranges from the skews left to neutral to skews right range (chart here). If you’re getting your “news” from social media, you may be getting inaccurate information. 9. Make sure your privacy settings are set to your liking. Here’s an informative guide from PC Magazine entitled, 28 Hidden Facebook Features Only Power Users Know. Breaking any habit takes a bit of effort, with the first few days being the hardest. Some folks find it easier to leave Facebook if they’re on another social media network like Instagram or Twitter. Once you’ve quit Facebook, use this as an opportunity to do more of what you enjoy and discover a kazillion other things to do. Read a book, go for a walk, play a game, call someone, start a hobby, cook, create a new playlist, have lunch with a friend, lift weights, create something with your hands, make a brain-healthy smoothie, call your mother… the possibilities and experiences are endless. If you enjoyed this post, subscribe to receive periodic blog updates and rewirement tips. Not sure? Here’s a sample newsletter. This flowchart is so cool.